Construct a Proto Type and Fit to Boat. Have weldment Tack welded Only till Fit Tested. Weldment made from Proto Type. 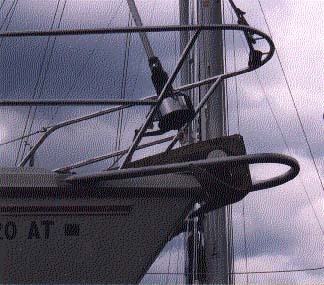 Mounting on Boat, Note Using Existing Bolts. 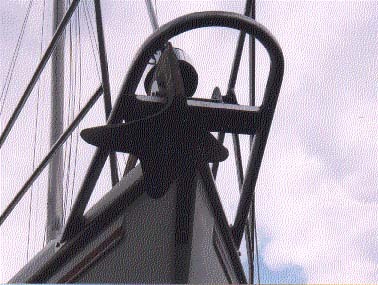 Mounted with Anchor in Place. 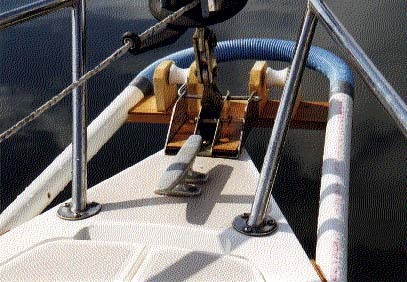 Finally a Bow-Anchor-Sprit that will look good on our Catalina 34 or even the C30 or C36. I spent all last summer struggling with the Danforth that did not hold the boat and did not fit on my 1986 C34 bow. 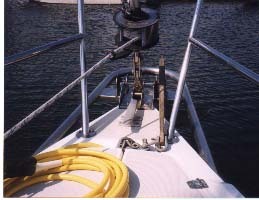 I have seen many professional and owner made Spirits to hold a Bruce 33lb plow anchor and none look "NOT ADDED ON". Most are cheaper though. So I designed my own. Any welders out there that want to make up a few? The design that I came up with uses thick walled Stainless Steel tubing bent to match closely the bow pulpit. 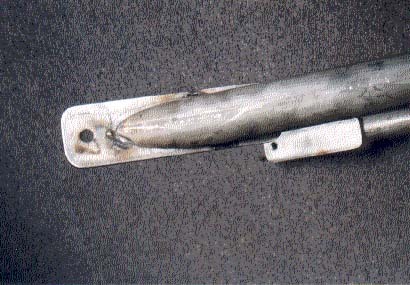 The rear ends of this tube have plates welded to them that bolt to the shear line (above the rub rail). 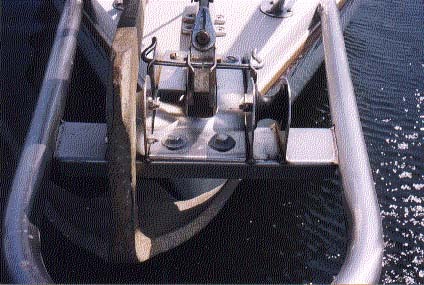 Access holes with cover plates had to be added in the anchor locker. 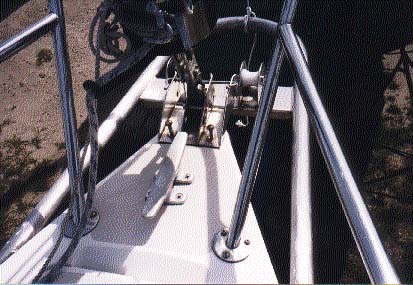 The front of the Bow-Anchor-Sprit is supported using a specially made bracket that fits between the existing factory roller bracket, using the same bolts as shown in the picture above. The only thing that I am not happy with is that thick wall tubing had to be polished and only a brush finish was achieved. I supplied the proto type, shown above, to the weld shop and he reproduced it just as I made it. I had him tack weld all the parts so that I could test it out to make sure the angle between the plates that mount against the shear rail were correct. I did have to break one of the tacks and adjust before returning it for final welding. After final welding it was polished to a brush semi shine finish. 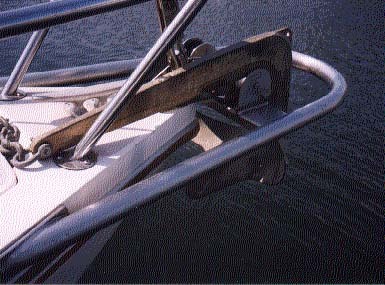 I used the rollers of the old bow unit and have found that the chain on the anchor tends to slip off. A deeper cut in the roller would solve this problem. This new Bow-Anchor-Sprit solved my problem of hauling the anchor over the rail and allowed me to use a much BIGGER anchor.